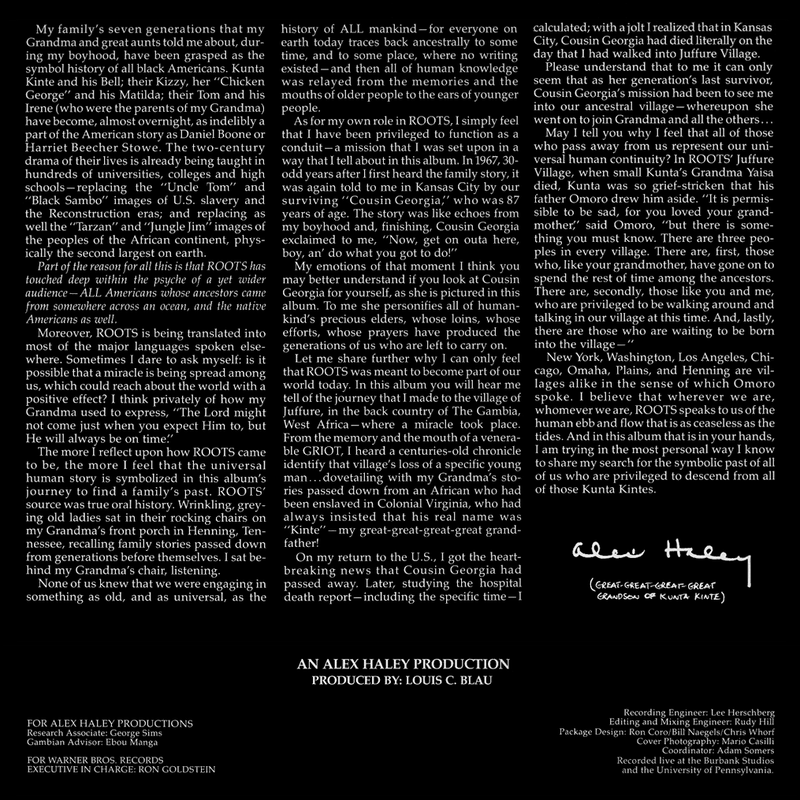 Alex Haley Tells The Story Of His Search For Roots is a 2-LP recording of a two-hour lecture Haley gave at the University of Pennsylvania in 1977. “On this album, I try to share my adventure of the past 12 years. It began as only a personal family search. 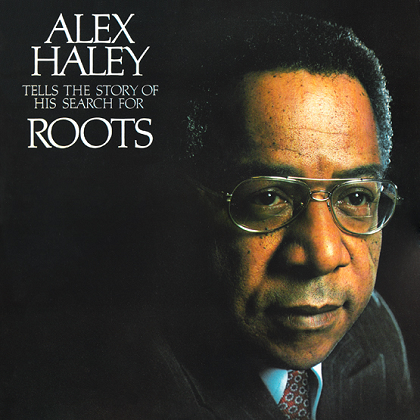 It grew into a published book—ROOTS—the results that are hard for me to comprehend.” ~ Alex Haley. “There’s an expression called ‘the peak experience’. It is that which emotionally nothing in your life ever can transcend. And I know I have had mine that first day in the back country in black West Africa. When we got up within sight of the village of Juffure the children who had inevitably been playing outside African villages, gave the word and the people came locking out of their huts. It’s a rather small village, only about seventy people. And villages in the back country are very much today as they were two hundred years ago, circular mud huts with conical thatched roofs. And from a distance I could see this small man with a pillbox hat and an off-white robe, and even from a distance there was an aura of ‘somebodiness’ about him. I just knew that was the man we had come to see. And when we got closer the interpreters left our party and went straight to him. And I had stepped unwittingly into a sequence of emotional events that always I feel awkward trying to describe, simply because I never ever verbally could convey, the power, the physical power of emotional occurrences.” ~ Alex Haley. Excerpted from Black History, Oral History and Genealogy. My family’s seven generations that my Grandma and great aunts told me about, during my boyhood, have been grasped as the symbol history of all black Americans. Kunta Kinte and his Bell; their Kizzy, her “Chicken George” and his Matilda; their Tom and his Irene (who were the parents of my Grandma) have become, almost overnight, as indelibly a part of the American story as Daniel Boone or Harriet Beecher Stowe. The two-century drama of their lives is already being taught in hundreds of universities, colleges and high schools—replacing the “Uncle Tom” and “Black Sambo” images of U.S. slavery and the Reconstruction eras; and replacing as well the “Tarzan” and “Jungle Jim” images of the peoples of the African continent, physically the second largest on earth. The more I reflect upon how ROOTS came to be, the more I feel that the universal human story is symbolized in this album’s journey to find a family’s past. ROOTS’ source was true oral history. Wrinkling, greying old ladies sat in their rocking chairs on my Grandma’s front porch in Henning, Tennessee, recalling family stories passed down from generations before themselves. I sat behind my Grandma’s chair, listening. None of us knew that we were engaging in something as old, and as universal, as the history of ALL mankind—for everyone on earth today traces back ancestrally to some time, and to some place, where no writing existed—and then all of human knowledge was relayed from the memories and the mouths of older people to the ears of younger people. My emotions of that moment I think you may better understand if you look at Cousin Georgia for yourself, as she is pictured in this album. To me she personifies all of humankind’s precious elders, whose loins, whose efforts, whose prayers have produced the generations of us who are left to carry on. Let me share further why I can only feel that ROOTS was meant to become part of our world today. In this album you will hear me tell of the journey that I made to the village of Juffure, in the back country of The Gambia, West Africa—where a miracle took place. From the memory and the mouth of a venerable GRIOT, I heard a centuries-old chronicle identify that village’s loss of a specific young man … dovetailing with my Grandma’s stories passed down from an African who had been enslaved in Colonial Virginia, who had always insisted that his real name was “Kinte”—my great-great-great-great grandfather! On my return to the U.S., I got the heartbreaking news that Cousin Georgia had passed away. Later, studying the hospital death report—including the specific time—I calculated; with a jolt I realized that in Kansas City, Cousin Georgia had died literally on the day that I had walked into Juffure Village. New York, Washington, Los Angeles, Chicago, Omaha, Plains, and Henning are villages alike in the sense of which Omoro spoke. I believe that wherever we are, whomever we are, ROOTS speaks to us of the human ebb and flow that is as ceaseless as the tides. And in this album that is in your hands, I am trying in the most personal way I know to share my search for the symbolic past of all of us who are privileged to descend from all of those Kunta Kintes. ~ Alex Haley.